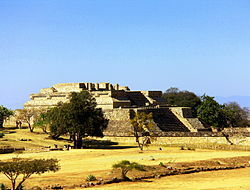 Caso, Alfonso (1932) “Monte Albán, richest archaeological find in the Americas”. National Geographic Magazine LXII: 487-512. Feinman, Gary M., and Linda M. Nicholas (1990) “At the Margins of the Monte Albán State: Settlement Patterns in the Ejutla Valley, Oaxaca, Mexico”. Latin American Antiquity 1: 216-246. Feinman, Gary M. and Linda M. Nicholas (2002) “Houses on a Hill: Classic Period Life at El Palmillo, Oaxaca, Mexico. Latin American Antiquity 13:251-277. Hutson, Scott (2002) Built Space and Bad Subjects. Journal of Social Archaeology. Paddock, John (1983) The Oaxaca Barrio at Teotihuacan. In The Cloud People, edited by K.V. Flannery and J. Marcus, pp. 170–175. Academic Press, New York. Mexican and Central American Archaeological Projects - Electronic articles published by the Division of Anthropology, American Museum of Natural History. View on Google Maps- With a short panoramic video of the site.